Album This song officially appears on the A Hard Day's Night (Mono) Official album. “A Hard Day’s Night” is a song by the English rock band The Beatles. Written by John Lennon, and credited to Lennon–McCartney, it was released on the movie soundtrack of the same name in 1964. It was later released in the U.K. as a single, with “Things We Said Today” as its B-side. In 1996, yet another version of events cropped up. In an Associated Press report, the producer of the film A Hard Day’s Night, Walter Shenson, stated that Lennon described to Shenson some of Starr’s funnier gaffes, including “a hard day’s night“, whereupon Shenson immediately decided that that was going to be the title of the movie (replacing other alternatives, including Beatlemania). Shenson then told Lennon that he needed a theme song for the film. One day I picked John up in a taxi and took him to Abbey Road for a recording session. The tune to the song ‘A Hard Day’s Night’ was in his head, the words scrawled on a birthday card from a fan to his little son Julian: ‘When I get home to you,’ it said, ‘I find my tiredness is through…’ Rather a feeble line about tiredness, I said. ‘OK,’ he said cheerfully and, borrowing my pen, instantly changed it to the slightly suggestive: ‘When I get home to you/I find the things that you do/Will make me feel all right.’ The other Beatles were there in the studio and, of course, the wonderful George Martin. John sort of hummed the tune to the others – they had no copies of the words or anything else. Three hours later I was none the wiser about how they’d done it but the record was made – and you can see the birthday card in the British Library. “A Hard Day’s Night” was first released to the United States, coming out on 26 June 1964 on the album A Hard Day’s Night, the soundtrack to the film, and released by United Artists. It was the first song to be released before single release (see below). The United Kingdom first heard “A Hard Day’s Night” when it was released there on 10 July 1964, both on the album A Hard Day’s Night, and as a single, backed with “Things We Said Today” on the B-side. Both the album and single were released by Parlophone Records. The single began charting on 18 July 1964, a week later ousting the Rolling Stones’ “It’s All Over Now” from the top spot on the British charts on 25 July 1964, coincidentally the day when both the American and British albums too hit the peak of their respective charts. The single stayed on top for three weeks, and lasted another nine weeks in the charts afterwards. The American single began its 13-week chart run five days after release, and on 1 August started a two-week-long run at the top, setting a new record—nobody before had ever held the number one position on both the album and singles charts in the United Kingdom and the United States at the same time. The Beatles were the first to do so, and continued to be the only ones who had done this until 1970 when Simon and Garfunkel achieved the same feat with their album Bridge over Troubled Water and its title track. “A Hard Day’s Night” went on to sell one million copies in America within just over five weeks. The song was the fifth of seven songs by the Beatles to hit #1 in a one-year period, an all-time record on the US charts. In order, these were “I Want to Hold Your Hand“, “She Loves You“, “Can’t Buy Me Love“, “Love Me Do“, “A Hard Day’s Night“, “I Feel Fine“, and “Eight Days a Week“. It was also the sixth of seven songs written by Lennon-McCartney to hit #1 in 1964, an all-time record on the US charts for writing the most songs to hit #1 in the same calendar year. In 1965, “A Hard Day’s Night” won The Beatles the Grammy Award for Best Performance by a Vocal Group. In 2004, this song was ranked number 154 on Rolling Stone’s list of “The 500 Greatest Songs of All Time“. “A Hard Day’s Night” is immediately identifiable before the vocals even begin, thanks to George Harrison’s unmistakable Rickenbacker 360/12 12-string guitar’s “mighty opening chord“. According to George Martin, “We knew it would open both the film and the soundtrack LP, so we wanted a particularly strong and effective beginning. The strident guitar chord was the perfect launch,” having what Ian MacDonald calls, “a significance in Beatles lore matched only by the concluding E major of “A Day in the Life“, the two opening and closing the group’s middle period of peak creativity“. “That sound you just associate with those early 1960s Beatles records“. A: It is F with a G on top, but you’ll have to ask Paul about the bass note to get the proper story. According to Walter Everett the opening chord has an introductory dominant function because McCartney plays D in the bass: Harrison and Martin play F A C G, over the bass D, on twelve-string guitar and piano respectively, giving the chord a mixture-coloured neighbour, F; two diatonic neighbours, A and C; plus an anticipation of the tonic, G — the major subtonic as played on guitar being a borrowed chord commonly used by the Beatles, first in “P.S. I Love You” (see mode mixture), and later in “Every Little Thing“, “Tomorrow Never Knows” and “Got to Get You into My Life” (in the latter two against a tonic pedal). Everett points out that the chord relates to the Beatles’ interest in pandiatonic harmony. This gives the notes: G-B-D-F-A-C (the B is a harmonic). One of the interesting things about this chord (as described by Pedler) is how McCartney’s high bass note reverberates inside the soundbox of Lennon’s acoustic guitar and begins to be picked up on Lennon’s microphone or pick-up during the sounding of the chord. This gives the chord its special “wavy” and unstable quality. Pedler describes the effect as a “virtual pull-off“. The chord’s notes were estimated using Fourier analysis, according to which Harrison played the A2, A3, D3, D4, G3, G4, C4, and another C4 on his 12-string guitar; McCartney played a D3 on his bass; producer George Martin played D3, F3, D5, G5, and E6 on the piano; and Lennon played a loud C5 on his six-string guitar. In November 2009, Wired published an article where Celemony’s Melodyne Editor with Direct Note Access technology was used to analyse the opening chord. Randy Bachman has stated that he heard the original masters of the recordings and could hear the 12-string guitar playing “an F chord, but you put a G on top, and you put a G on the bottom, and you put a C next to that G“, “a D on the bass“, and “rhythm guitar was a D chord with a sus 4“. A repeated arpeggio outlining the notes of the opening chord ends the song in a circular fashion. This provides, “a sonic confirmation that the thirty-six hours we have just seen [in the movie] will go on and on and on“. This was an inspiration of George Martin, who said: “Again, that’s film writing. I was stressing to them the importance of making the song fit, not actually finishing it but dangling on so that you’re into the next mood.” The song contains 12 other chords. During the recording of “A Hard Day’s Night“, Lennon and McCartney doubletracked their vocals throughout including the chorus. Lennon sings the lead vocal on the verses and Paul sings lead on the middle eight. 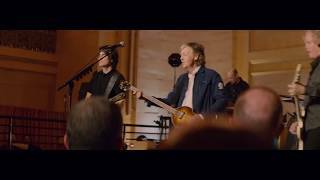 During the chorus McCartney handles the high harmony and Lennon the low harmony. Take 7 reveals that the lyrics were still not set with Lennon singing “you make me feel all right” and McCartney and Harrison still unsteady with their respective lines, ending with Lennon chiding them with the line “I heard a funny chord“. The song closes with Harrison playing an arpeggio of the opening chord (Fadd9) during the fade-out, the first time the Beatles had used such a technique — most, if not all, of their earlier work had closed with a final chord (and cadence), such as “She Loves You” and “I Want to Hold Your Hand“. The lyrics speak about the singer’s undying devotion to his lover, and how he works so she can buy the things she wants. The singer sings about his tiredness when he comes home from work, but how the things that his lover does perk him up. Critics have pointed out that the first verse, repeated as the last verse, exploits three worn-out-sounding cliches, “a hard day’s work,” “working like a dog,” and “sleeping like a log,” only to quicken up the pace with a patter-couplet reassuring the singer’s girlfriend that his energy and pleasure level have been renewed by her ministrations. In 1965, Peter Sellers released a 45 rpm single on which he recited the lyrics to “A Hard Day’s Night” in the manner of Laurence Olivier’s famous performance of Shakespeare’s Richard III. He later performed the piece in full costume for the Granada television show The Music of Lennon and McCartney. [a] mono 23 Apr 1964. UK: Parlophone R5160 single 1964, Parlophone PMC 1230 Hard Day’s Night 1964, Parlophone PMC 7016 Collection of Oldies 1966. US: Capitol 5222 single 1964, United Artists UAL 3366 Hard Day’s Night 1964, Apple SKBO-3403 The Beatles 1962-1966 1973. CD: EMI CDP 7 46437 2 Hard Day’s Night 1987, EMI single 1989. [a1] mono made from [a] 1964, by United Artists. US: United Artists UAS 6366 Hard Day’s Night 1964. [b] mono 9 Jun 1964. US: United Artists K-9006 (cassette) Hard Day’s Night 1968, United Artists U-9006 (8-track tape) Hard Day’s Night 1970. [c] stereo 22 Jun 1964. UK: Parlophone PCS 3058 Hard Day’s Night 1964, Parlophone PCS 7016 Collection of Oldies 1966, Apple PCSP 717 The Beatles 1962-1966 1973. US: Capitol SV-12199 Reel Music 1982, Capitol SV-12245 20 Greatest Hits 1982. CD: EMI CDP 7 97036 2 The Beatles 1962-1966 1993. Mono [b], also used in the original film print of A Hard Day’s Night, has an extended ending, made by editing, in which the guitar figure at the end is heard 5 times instead of 3; this is actually heard only in the end title. Note that [b] is not on the older reel-to-reel tape release. [a1] is mono, but shifts toward the left for Paul’s solo vocal bridge (“when I’m home. . .”) and toward the right for the instrumental break. The centering of the vocal is better in the new stereo mix [d] than the old one [c], where it is pulled a bit to the right. “Reel Music” was the first US release in stereo, 18 years late. 2:44 • Outtake	• E • Take 1. [...] Presented here, however, is the previously unreleased first recorded run-though, Take 1, with numerous vocal and instrumental variations from the master. The crashing guitar chord that distinguished that master version is already in place, but the bridge, later plugged by a piano played by George Martin, was filled here by a guitar solo. The Beatles recognised that Take 1 was never going to be the best take, hence the laughter as the recording began to dissolve, but it captures the essence of the productive yet fun sessions that were typical of this period. “A Hard Day's Night” has been played in 261 concerts.